"I would like to have a caricature of 4 ladies for a farewell present for my boss and therefore I would like to check with you on a few things before we proceed with the ordering. 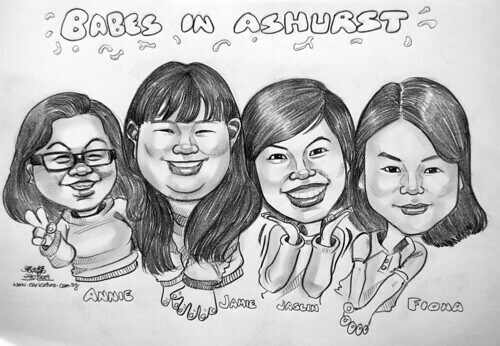 We would like to have a headline of "Babes in Ashurst" and can we also have our names under our Caricature?" I have received the caricature. It is very nicely done and we were very satisfied with your work. Thanks so much again and there will definitely get in touch with you soon for future work.